I have a new installation of Windows 7 and the first thing I did was download Internet Security. It's a clean install and I have administrator rights on the machine and, to be sure, I ran the installation as administrator. Well, it goes so far and then tries to start up. I get a dialog box thing tagged to the right hand side of the screen saying that it's waiting for a service to start. No name is given. "A major probelm has prevented the application from starting. 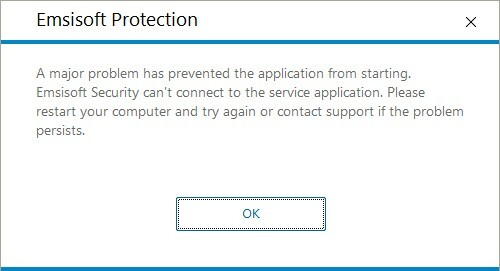 Emsisoft Security can't connect to the service application. Please restart your computer and try again or contact support if the problem persists." I have restarted the machine a number of times and each time I try to start the application I get the above message. What do I do? I have uninstalled it and have even used your cleaning tool as well. And still I get this. There may be one clue. When installing, I didn't put a licence code in as this is for a new machine and so I don't yet have a licence for it. I selected the Free Trial and then on the third step of the installation I clicked on the Finish button as I had finished the installation (there were no other options anyway) and a dialog box popped up asking if I really wanted to leave because the installation had to be finished. As I selected everything until this point I can only assume that a service was installed. But this is just a guess. Anyway, I am now without a malware application and I am not sure what to do. Could you advise me on a plan of action please? I have done as requested and you have my log file sent via Private Message. I've been told that it's possible that the hotfix for Windows available at this link may resolve the issue, although please note that it is not guaranteed. Also note that the hostfix download from Microsoft will more than likely come in a self-extracting archive of some sort. When you run it, you will need to extract the hotfix installer somewhere (such as your Desktop, Documents, etc) easy to find, and then you can run the hotfix installer. If you don't change where the download from Microsoft extracts to when you run it, then it won't extract the files and you won't be able to install the hotfix. I have followed the instructions, first attempting to load the Hotix. Alas, that didn't work as the "Searching for Updates on this Computer" dialog just goes on for ever. Whatever Microsoft have done they haven't improved their file search routine since mangling it with Search v5. So, stopped that and rebooted. Uninstalled Emsisoft Protection. Rebooted. Ran the Emsisoft removal program to make sure it had gone (and was told that there wasn't a hint of the product anywhere). Then as per your instructions I then rebooted a second time. I downloaded from the first link that you suggested. I went through the installation. And then waited. After an age the actual configuration window came up (and I mean 'after an age'). I chose on the first window not to enter a licence (as I have said before it has expired), on the second I chose to protect against PUPs and then on the finish button I got the warning that all steps had to be undertaken. Yes, I went through all of the implementation steps. So I cleared that and waited. "A major problem has prevented the application from starting. Emsisoft Security can't connect to the service application. Please restart your computer and try again or contact support if the problem persists." In other words, nothing has changed. What should I do now? My understanding is that this is only happening with new installations of version 12 of Emsisoft Internet Security. It might be possible to install version 11 and allow it to upgrade to version 12, and thus bypass the issue. You should be able to get the most recent version of Emsisoft Internet Security 11 from FileHippo at this link (the download will start automatically shortly after clicking the link) (edit: link is for wrong product). Please be sure to disconnect your Internet before installing it in order to prevent it from updating to version 12 before the installation is finished. Once installed and working, you can reconnect your Internet and allow the update to take place. Hello and thanks, but that link is for Anti-Malware suite. Do you have a link to version 11 of Internet Security from your own site? Please excuse the concern that I have for downloading a malware protection application from a third party site. I don't think that sending me to a page which autostarts a video and also has 28 requests blocked by uBlocker is going to fill me with any confidence. Surely you must have an archive page of your own somewhere. The issue has been fixed, and you can download the latest version of Emsisoft Internet Security that includes this fix from this link or this link. Well, the good news is that things moved further along the line. But not all the way. The installation worked and when the application started it tried to update the data automatically and it failed straight away with an error saying that the update was terminated. I try a Quick Scan to see what else is broken and though it runs through a scan the same error message comes up about 40% of the way through. So it does appear that I have more or less a malware protection suite though it does throw up errors and also it can't update its database. edit. Your forum stripped away the screenshot. The error message said, "An unexpected internal processing error occured. Please contact the support team." This morning I started up the laptop and I received the same error message. I can only assume that it was trying to update but the information that it presented was rather sparse. This is a copy of my desktop. I apologise at the screenshot as I haven't even installed my picture editing packages yet onto this new machine. Adding in here since after my original post about complete Win7 hang after first auto update (http://support.emsisoft.com/topic/25574-psa-for-anyone-else-that-has-issues-with-auto-update-to-version-12-delete-11-and-clean-install-12/). I am now at the same spot as others here after using the NEW file in the above link. I have since uninstalled the new file as well until we see any further help from Emsisoft. After installing the newest file clean-install it appeared to install without error, however after finishing install I received the following sequence of errors. First in the Win7 notification area, EIS icon is red and when hovered it says "Background Guard"
Do we just keep trying the re-install, restart sequence or does staff have any more ideas/details on what may be going wrong based on the errors we have provided? UPDATE - Okay on a whim since it still was killing this other PC, and they have the new fixed Ver 12 clean install file, I re-installed Ver 11 while disconnected from the internet. After ensuring Ver 11 was good I shut down and re-enabled internet. Ver 11 did not immediately appear to start going after Ver 12, but the Updates Tab on the main GUI showed an activity bar and said updates available. I manually clicked on the Updates Tab and it started downloading Ver 12. After finishing installation I appear to have another good system on ver 12. One more option if you still have your old copy of Ver 11 archived or can get it from here or one of their hosts. Well that all lasted for 3 EIS hourly updates until the program decided to corrupt its own updates, TWO Separate attempts at installation. Basically the technique of manual install Ver11 w/o Internet access and then allowing auto-update to ver 12 only works for the first update. After that, every hourly update tries to install the entire set of program modules, all in different sizes until finally even a manual Win7 restart hangs and I have to go all the way back to before-installed restore point. 2 days of this and I am done until Support can figure out why this Win7Prox64 PC has this problem and my Win7Homex64 Laptop right next to it is perfectly happy after a single Ver12 auto-update-install and 2 days of hourly signature updates. I'll load some Avira Free for now and sit behind my hardware firewall. ... The error message said, "An unexpected internal processing error occured. Please contact the support team." Open Emsisoft Internet Security from the icon on your desktop. In the 4 little gray boxes at the bottom, move your mouse into the one that says Support, and click anywhere in that gray box. At the bottom, turn on the option that says Enable advanced debug logging. Either click on Overview in the menu at the top, or close the Emsisoft Internet Security window. Reproduce the issue you are having (run an update and wait for the "internal processing error"). Once you have reproduced the issue, open Emsisoft Internet Security again, and click on the gray box for Support again. Click on the button that says Send an email. Select the logs in the left that show today's dates. Fill in the e-mail contact form with your name, your e-mail address, and a description of what the logs are for (if possible please leave a link to the topic on the forums that the logs are related to in your message). If you have any screenshots or another file that you need to send with the logs, then you can click the Attach file button at the bottom (only one file can be attached at a time). Click on Send now at the bottom once you are ready to send the logs. Important: Please be sure to turn debug logging back off after sending us the logs. There are some negative effects to having debug logging turned on, such as reduced performance and wasting hard drive space, and it is not recommended to leave debug logging turned on for a long period of time unless it is necessary to collect debug logs. Logs database (contains the logs you can view in Emsisoft Internet Security by clicking on Logs at the top of the window). "Your message couldn't be submitted because of a technical problem. Please try again later or send your message to [email protected]"
There was no indication of the error message. I will reboot and try again. May I suggest that when your application raises an error that at least an error number is raised? I have found the Update Logs in the EIS but I don't think that they are that illuminating, I am afraid. Tomorrow I am going to blat the drive, download the EIS from your site and then start again from fresh. I can't risk being caught with no security for what is now well over a week. I will report back then. I don't think that will help. I suspect that it's being caused by our license server, and that there's nothing wrong with EIS. I'm going to send you a temporary license key to test with, and see if that resolves the issue. Anyway, I didn't put in the temporary licence that you had kindly sent me as that, I decided, wouldn't be much use to the problem solving. As I say, I started again today and just after the bit where I say that I want to join the Malware Upload Group thingy (step 2), the application started downloading stuff. And instead of the dialog box on the right giving me grief, I was invited to read an article on Malware as I am accustomed. Also after the I want PUP Detection option I didn't get the message about the installation not completing. So, there you have it. If one wishes to install IES 12 all one has to do is to reinstall Windows. Reinstalling Windows and/or EIS shouldn't have cleared the incorrect license status being sent by our servers when EIS verified your license information. Chances are that something else happened to resolve the issue (possibly one of our developers corrected the problem in our servers that caused the incorrect license status to be sent). Arthur. I was starting to have other issues with Windows 7; particularly with the diseased User Library Folders which confused something in Windows and the best thing was a complete reformat and install once again. Now, the Licence Server thing is a concern. Surely it should 'fail safe'. Wouldn't it be better PR for Emisoft if the Licence Server went wobbly that there's a quick override switich that allows temporary access to the updates rather than close down access? We constantly get all sort of interesting articles and newsletter about how good your company is and we, as users, ought to deal with the world in general when it comes to internet security. But then to get locked out of updates when the fault is at your end is a worry. I was locked out for over a week and whilst I can understand an outage lasting a day and I can easily accept that but to be locked out for over a week, i.e. nine or ten days depending on where your midnight lies, isn't acceptable. And, yes, it would have meant that some people would have had access for a few days to updated data but that's no worse than a free trial. I have been with Emisoft for years and it is still my number one choice when it comes to internet security but you don't realise how close I was to going to another application and I would have stayed with them for years until they caused a massive SNAFU. I think it was fair to say that I was hours away from going elsewhere. One thing that does need looking at when installing EIS is that when installing on a virgin Windows 7 machine with no SP installed is that scary message warning us about needing SP1. The message was enough to frighten me off installing it because it wouldn't say if it would be broken. So I had to go and find SP1 on this unprotected machine first. It would be good if we were warned as to what the dangers were and to be told if it would be possible to EIS on a virgin machine, get SP1 and then get the updates to EIS. That would offer more security and peace of mind. In my world, the second thing to be installed on a machine would be a malware suite such as yours after the first thing: the raw operating system. That would disable license validation. Since replacing the license key has been a viable workaround for this in the past, it has not been necessary to implement any sort of bypass to license validation. Service Pack 1 has been required by all of our products since it was released, and it has always been required by EIS. There will be problems with EIS if Service Pack 1 is missing, since Service Pack 1 fixed rather serious bugs in Windows, and our products no longer contain workarounds to function properly with those bugs present.